Length 2 km, terrain: flat and marked by plenty of Glühwein watering holes! 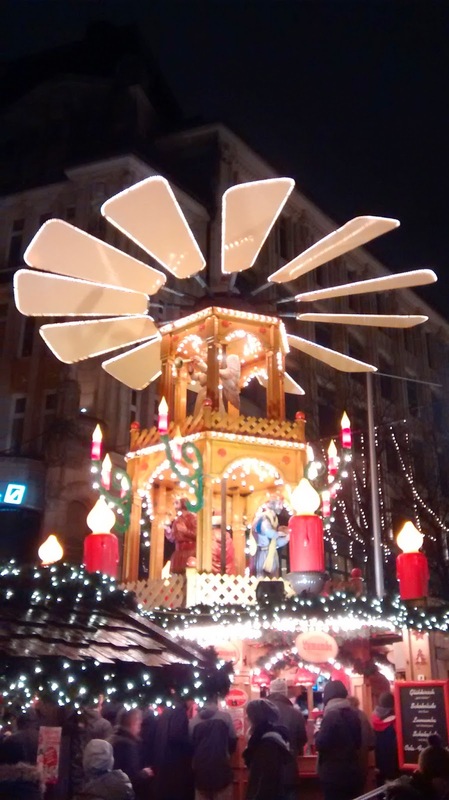 Here's a route that fits the Christmas week: instead of a normal run (one that might include actual running), it sets out on a tour through the Weihnachtsmärkte (Christmas Markets) of nearby Hamburg, Germany. The weather has been horribly wet and stormy here, but the markets -- soggy as they are -- radiate enough Christmas cheer to lead you out of any depression, and almost make you forget the rivulets running down into your underwear. The bright lights and the stands selling homemade gifts, great food and -- of course -- spicy Glühwein (mulled wine) help warm you up, as if you were sprinting towards a 10k finish line. Except that here the huge crowds aren't moving the same direction as you, as in a roadrace, but mostly seem to heading face-on. So, when in Hamburg, do as the hamburgers do it: head for the Christmas markets for a slow-motion tour of that good old Christmas magic! 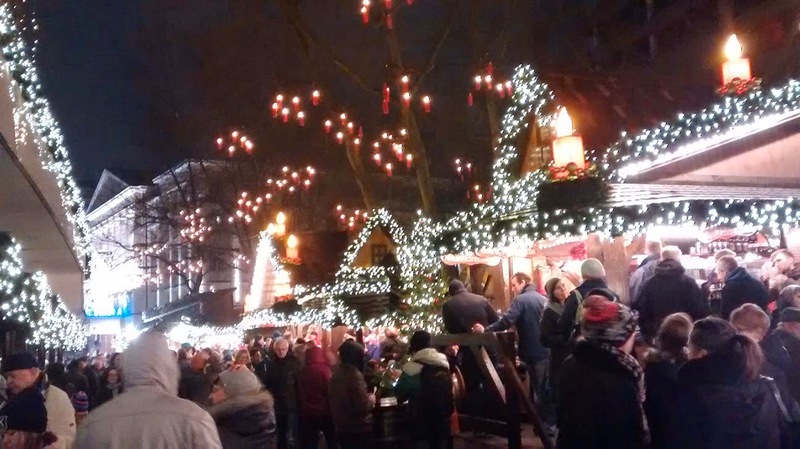 We'll start at Gänsemarkt (the Goose Market) with its Feuerzangenbowle stand, where sugar pyramids are soaked in rum, then set on fire to drip into a caldron of hot punch made of red wine, citrus juices and spices. A great way to start the trip: things are warming up already. Then, head down to Jungfernstieg (Maidens' walk), along the Alster lakefront, with its parked Märchenschiffe (Fairy-Tale Ships). Each ship has activities for kids, like a cookie bakery, Christmas-decoration creation, or story-reading. 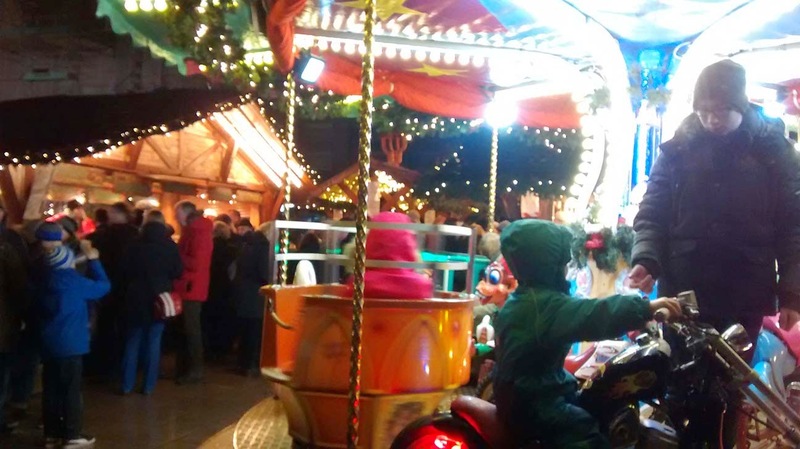 Now, cross the street and head under the columned arcades along the Alster River, past some gourmet punch- and Glühwein stands to the Rathausplatz (City Hall Square), where the main market is held. It has the best stuff for sale and some of the best food, even if it is a bit (OK, a lot) crowded. Here, your progress will be slowed to a crawl. You'd better take a liking to being glued in place pretty quickly. Now head north along Mönkebergstraße to loop around the Sankt Petri church. There is a carousel here, and things are a bit less crowded out back. Did I mention that there is Glühwein here, too? Now continue to the next market, just 100 meters away, at Gerhard-Hauptmann-Platz, with its Winterwald forest and twin Glühwein houses. After you've fortified yourself with enough Glühwein (hey, it's too inviting here to say no), find your way out of the wald and finish the tour with a trip up Spitalerstraße and its gigantic "Pyramid". This is one of the typical wooden Christmas decorations from the Erzgebirge mountains in eastern Germany. Traditionally, the propellers at the top of the pyramids would be turned by the rising hot air of the candles burning below, and they would move a parade of wooden figures in a circle. This one houses, er -- can I even mention it? -- another Glühwein stand. Oh, yeah, and finally, here's the real message of this post: Have a HAPPY HOLIDAY, wherever you are!